Food allergies are relatively common in the United States. The first step in becoming allergic to a food is “losing oral tolerance”. This is a fancy way of saying that your body is losing the normal (tolerant) response to the food, and going rogue. To develop a full-blown allergic response to a food, it actually requires TWO exposures to the food. On the first exposure, your body has to decide whether this new food is friend or foe. For some reason (probably largely genetic), some people have over-protective immune systems that tend to flag ordinary foods as threats. Once the immune system has flagged the food as a threat, it starts preparing to defend itself for the next exposure. To do this, your body’s B-cells (the type of immune cells that make antibodies) start producing antibodies against the threatening food. 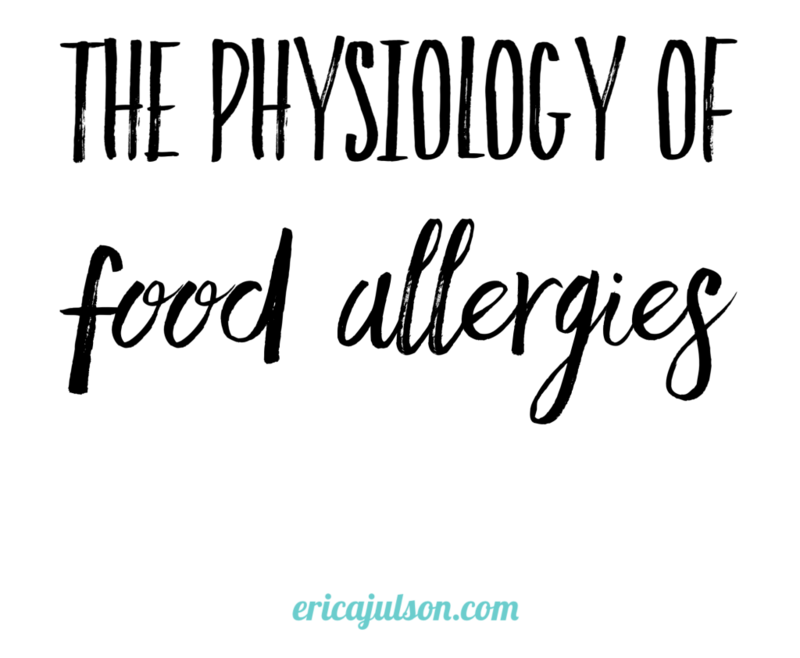 The type of antibody involved in allergies is called IgE (immunoglobin E) (immunoglobin is just another name for antibody). Each “threatening” food gets its own unique type of antibody that is only capable of binding to that specific food antigen. So, on the first exposure, you don’t actually feel any symptoms. Although your body knows it doesn’t like that food, it’s not ready to immediately launch an attack (that takes some time and energy, after all). In-between the first & second exposure, your body is preparing itself for a second attack. Once your body has made a whole bunch of IgE for the offending food, those antibodies circulate around your blood stream & attach themselves to mast cells. Mast cells are a type of tissue-specific white blood cell, located on membranes of your body, like the skin, mucous membranes, GI tract, and lungs. Mast cells contain packets (called granules) of pain-causing & inflammation-inducing chemicals that they store up & are ready to release into the environment at a moment’s notice. These chemicals (also known as “mediators”) are responsible for creating the unpleasant symptoms of an allergic response. 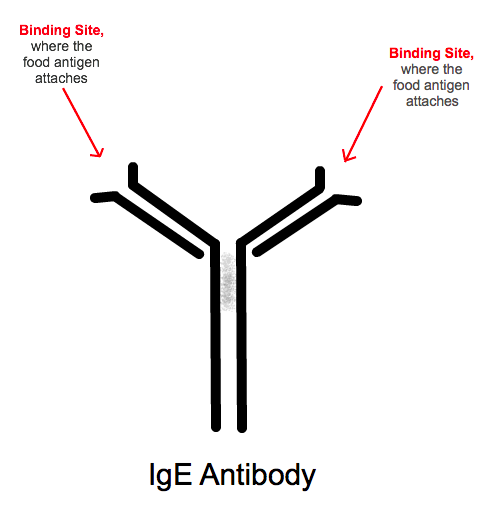 The IgE antibodies are kind of like soldiers, guarding your body from any threats, always on the lookout for the presence of the “threatening” food. Fun fact: one mast cell can have 100,000 different IgE molecules on its surface! The second time you eat the offending food, your body’s immune system is ready and waiting with IgE “soldiers” mounted on mast cells. This time, you WILL have an allergic reaction. You eat the offending food, digest and absorb it into your bloodstream. Now those food antigens are circulating through your blood. Eventually, the food antigens will come into contact with the IgE antibodies mounted on your tissue’s mast cells. 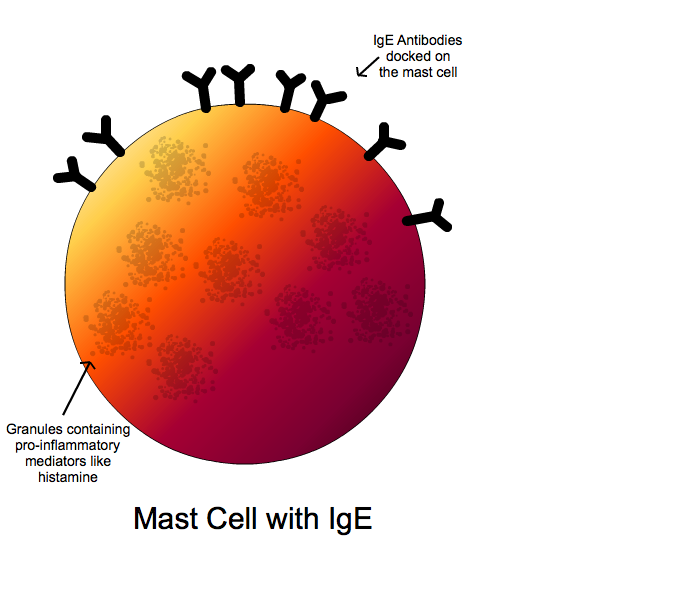 The attachment of the food antigen to the IgE antibodies causes the mast cell to “degranulate”, aka release packets (granules) of pro-inflammatory molecules like histamine and cytokines, which trigger an allergic reaction. The purpose of degranulation is to destroy the threat. The chemical mediators (like histamine) released from the mast cell cause physiological changes in your body. In fact, they are called “mediators” because they do just that. They “mediate” changes in the body. Each mediator causes a unique physiologic change, but in general, they increase blood flow to the area and increase blood vessel permeability so that more immune cells can come to the area and attack the threat (this is also what causes redness and swelling). The mediators also increase smooth muscle contraction to help expel any allergens from the lungs or GI tract (and cause symptoms of asthma and diarrhea). The symptoms you experience depend on which mast cells degranulate. For example, if the mast cells in your skin degranulate, you may get hives. If the mast cells in your lungs degranulate, you may have trouble breathing or develop an asthma attack. If the mast cells in your GI tract degranulate, you may get diarrhea. 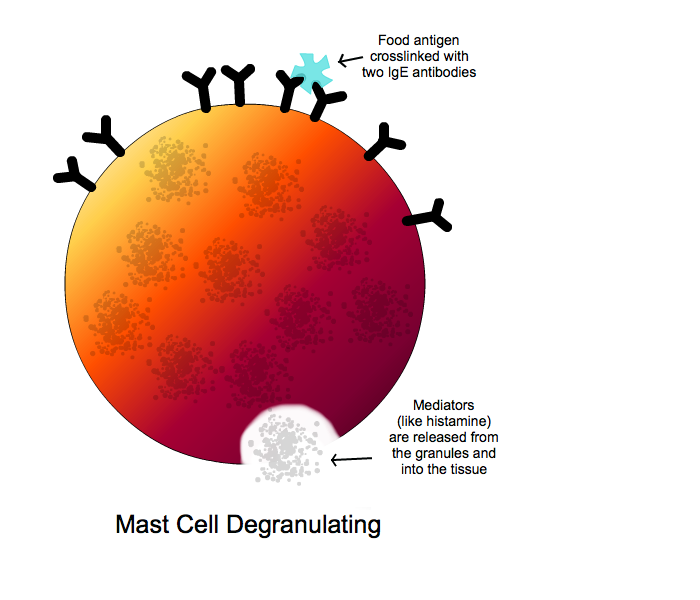 If mast cells start degranulating all over your body, you are experiencing anaphylaxis, a serious and potentially life-threatening reaction that may require an epinephrine injection to combat. When anaphylaxis occurs, many mast cells degranulate at once, causing blood vessels all over the body to increase their permeability. This causes too much liquid to leak out into the tissues, leading to severe swelling and a dangerous drop in blood pressure that can cause your organs to stop functioning. A quick shot of epinephrine (adrenaline) is need to rapidly constrict blood vessels & bring blood pressure back up to normal. Symptoms of a food allergy usually occur rapidly, about 5-30 minutes after ingestion of the offending food, and are typically obvious to the person they are affecting. This causes the symptoms of an allergic response, like swelling, itching, trouble breathing, etc. 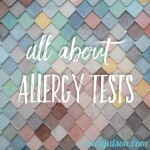 The symptoms will subside when exposure to the allergen is gone, or when anti-allergy medications, like anti-histamines, are taken. 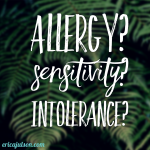 Stay tuned for more articles on allergies, sensitivities, and intolerances. 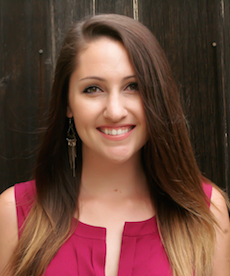 If you’d like a broad overview of how these 3 conditions differ, check out this article. 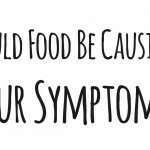 Could Food Be Causing Your Symptoms?